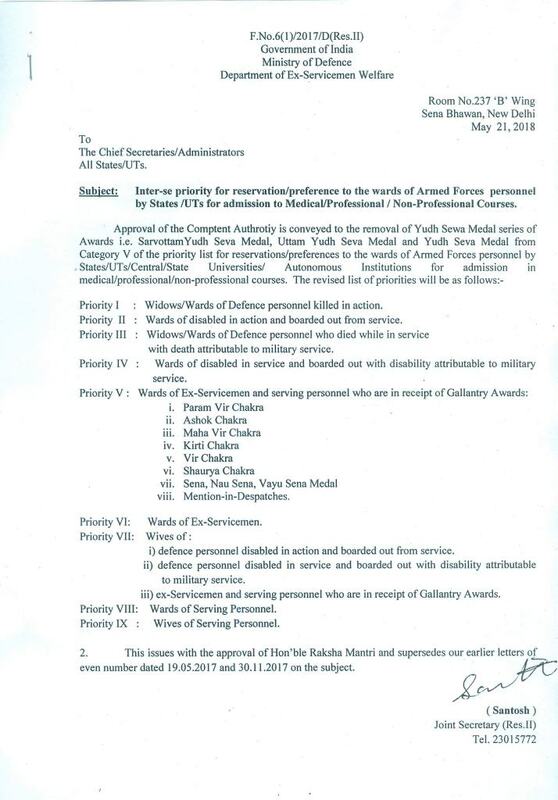 Subject: Inter-se priority for reservation/preference to the wards of Armed Forces personnel by States/UTs for admission to Medical/Professional / Non-Professional Courses. Priority I : Widows/Wards of Defence personnel killed in action. Priority II : Wards of disabled in action and boarded out from service. Priority III : Widows/Wards of Defence personnel who died while in service with death attributable to military service. 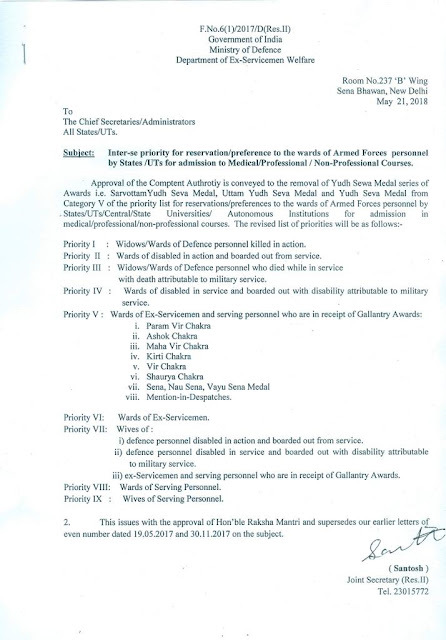 Priority IV : Wards of disabled in service and boarded out with disability attributable to military service. Priority VI: Wards of Ex-Servicemen. i) defence personnel disabled in action and boarded out from service. ii) defence personnel disabled in service and boarded out with disability attributable to military service. iii) ex-Servicemen and serving personnel who are in receipt of Gallantry Awards. Priority VIII: Wards of Serving Personnel. Priority IX : Wives of Serving Personnel. 2. This issues with the approval of Hon’ble Raksha Mantri and supersedes our earlier letters of even number dated 19.05.2017 and 30.11.2017 on the subject.